This past weekend seems (so far) to have been the start of a meteorological upswing here in the Boston area. It was bright and almost balmy, with mornings in the 30s and afternoons in the low 50s. On Sunday afternoon, I was driving to the market and passed four kids – I’d guess grade-schoolers – in shorts and fleece jackets, running a lemonade stand. I had two reactions: First, I wondered what in the world their parents were thinking. Then I laughed, because I was out in just a long-sleeved tee and jeans myself. We New Englanders have a unique enthusiasm for those first days when you can smell softening earth in the air; all that wintertime stoicism yields to the hopeful joy of Spring, even if Spring is actually still a ways away. In any case, this little ramble is a means of explaining why, when I saw hothouse rhubarb at the store this morning, I grabbed a few stalks, and then circled back for some strawberries that had likely traveled more miles to that grocery store than I have traveled, cumulatively, since welcoming The Lass. I’ll really try to be more of a locavore once anything here starts growing, but, today, I couldn’t ignore the inspiration. 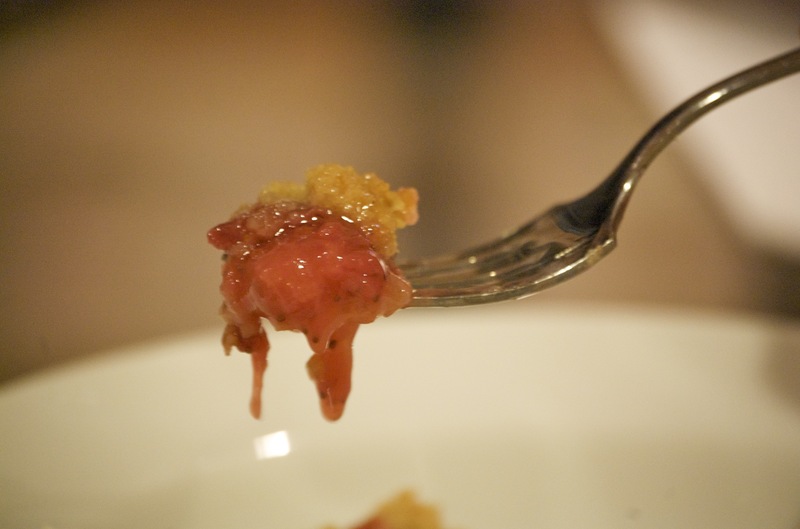 Inspiration had also come from the Facebook post from a friend yesterday afternoon, musing over whether rhubarb crumble could “count” as a vegetable to go with the evening meal. 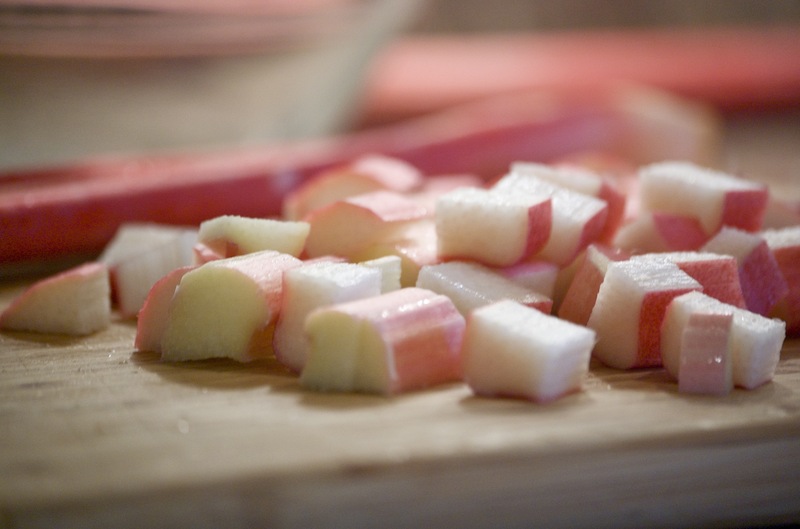 I, along with several others, quickly and heartily assured her that rhubarb is – in fact – a vegetable, and that the sweet-tart treat would surely appeal more to her pre-schooler than would a pile of broccoli. The whole exchange strangely echoed that image of the kids and their lemonade stand; something about the first breath of Spring just makes us want to loosen up, to live a little more than we have been all winter long. (Pre)seasonal inspiration having hit me from all sides, I combined a strawberry-rhubarb filling from Cooks’ Illustrated with Ina Garten’s crisp topping and came up with this little Spring preview. Warm out of the oven, it was comforting enough to stand up to the chill still in the evening air, while its bright flavors rivaled even the intrepid robin as a harbinger of Spring. Here’s hoping that the fair winds last longer than this dessert! Toss fruit with sugar, lemon juice and orange zest, vanilla extract, and tapioca; let stand for 15 minutes. Meanwhile, combine 1 1/2 cups flour, 1 cup granulated sugar, 1/2 cup brown sugar, salt, oatmeal, and the cold, diced butter in the bowl of an electric mixer fitted with a paddle attachment. Mix on low speed until the butter is pea-sized and the mixture is crumbly. Transfer the filling into a deep pie dish or small casserole (about 2 quarts.) 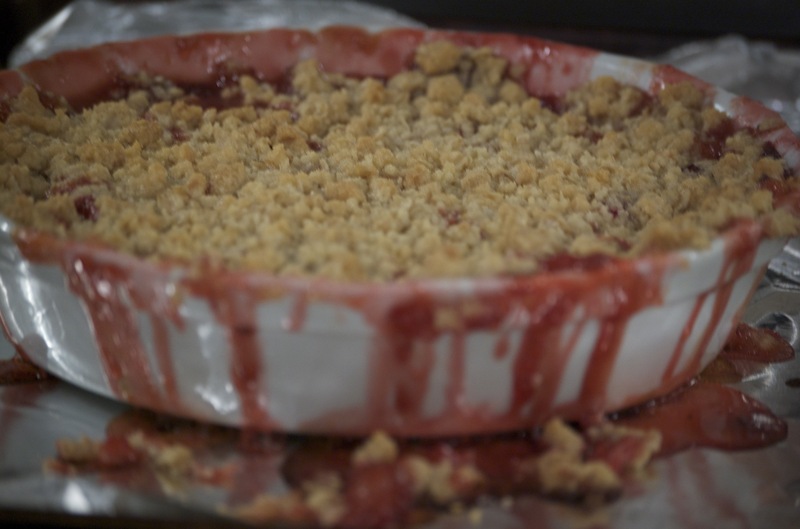 Top with the 2 tablespoons of diced butter, then sprinkle 1/2 of the crisp topping evenly on top of the strawberry-rhubarb filling. Reserve the rest in an airtight container in the refrigerator for a few days, or in the freezer for a few weeks. Place the prepared crisp on a sturdy baking sheet lined with foil. Mmm. Strawberry Rhubarb is one of my favorites. It gets me thinking of July 4th and the Noonmark Diner. Sounds like a yummy recipe. Yum! Sounds delicious. But then anything with rhubarb works for me. I’m intrigued by the quick cooking tapioca in with the fruit (and veg!). I assume it absorbs some of the juices and thickens up the filling a bit?